The Corn Palace, a town tradition in the spirit of county fairs, not so corny as one might think. One might imagine that the Corn Palace is “corny”—but in reality its magic gathers the townspeople of Mitchell together in a most unique way. Mitchell, South Dakota is the farm country home of the original Corn Palace. The people of the town are enthusiastic, as well they might be, because the real show is the endless heart and pride the community contributes to their own one-of-a-kind attraction. AND it is FREE for everyone to see. Traveling along the byway, it’s mighty easy as the billboards pass by, to judge the “Corn Palace” as just another one of those attractions that stretch the pocketbook without delivering the goods. The Corn Palace is NOT one of these. This is a down-home, farm-town art, great products, and eco-information center. An artistic transformation of dried corn-on-the-cob to extraordinarily beautiful graphic art. The theme changes annually: this year’s is “American Pride”—Uncle Sam Needs You, apple pie, family church, sporty Mustang and much more. 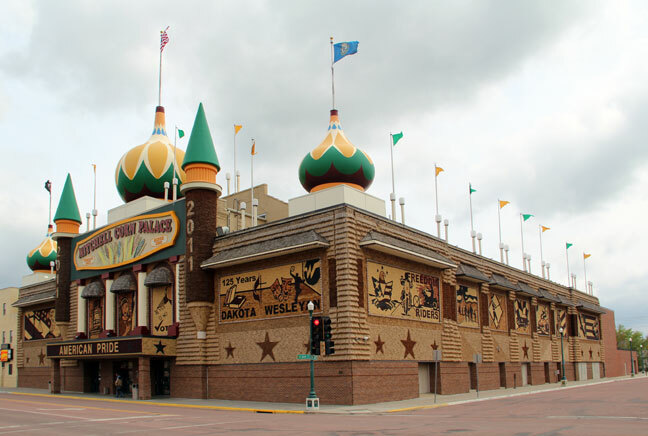 As CP director, Mark Schilling, related to me: “Eight years before the turn of the 20th century -1892- when Mitchell, South Dakota was a small, 12-year-old city of 3,000 inhabitants—the WORLD’S ONLY CORN PALACE—was established on the city’s Main Street. During its over 100 years of existence, it has become known worldwide and now attracts more than a half a million visitors annually. The palace was conceived as a gathering place where city residents and their rural neighbors could enjoy a fall festival with extraordinary stage entertainment – a celebration to climax a crop-growing season and harvest. This tradition continues today with the annual Corn Palace Festival this year, August 23rd – August 28th, 2011.“Some 500,000 tourists come from around the nation each year to see the uniquely designed corn murals which are changed to new designs each year. The city’s first Corn Palace was built as a way to prove to the world that South Dakota had a healthy agricultural climate,” he said. The remarkable thing about this corn edifice is that generations of families here and in surrounding communities have started their life journeys working together contributing to the Corn Palace effort. Whether by imagining the art, decorating the center, growing the special corn, helping with construction, manning the booths, many learned residents contributing as docents to the education of visitors, or other innumerable tasks, the region celebrates teamwork while it spotlights the history and benefits of that amazingly versatile vegetable: CORN. There is a plethora of corn history here-abouts in Mitchell, South Dakota. This combines with a wealth of good humor, and unique family fun for all. Try taste-tempting foods and snacks whose origins date back to 19th century county and Grange fairs. (And, of course, while you are in South Dakota don’t forget to take the time to visit the Presidents at Mount Rushmore and other South Dakota wonders. “What’s a look,” I asked. The Dakotans are a marvelous, down-to-earth people: carved by frigid winters and tanned by life on warm rolling plains; hot summer days; skin burning winds and sideways driven snow—forming a solid American-farming way of life on the plains Lewis and Clark admired so much. I LOVED the report on the Corn Palace. I had no idea that the site centered around art. I love how the community comes together to work on that project. In my state of Maine there is a resurgence of local agriculture, and you can get locally grown food year ’round. Combining local agriculture with art happens at our tri-weekly farmers’ market—but actually making the art from the food is something that I don’t believe I’ve seen! And I also love the expression, “two looks down the road.” With our winding New England roads, we’d have to say, “8 looks down the road.” Thanks for the reports and GREAT photographs. Wow. I’ve heard of the Corn Palace but had no idea what an elegant transformation from corn to art that it apparently is. If I ever get out that way, I’ll certainly pay a visit.